Faced with hard data showing their policy shift has failed poor women living in underserved area, the only Republican response is to call foul? What's foul are cover-ups, scapegoating and policy based on religion rather than the public interest. After the Oscar victory for “Spotlight,” let’s shine one on the effects of excluding Planned Parenthood affiliates from the Texas Women’s Health Program and the appalling imbroglio after the study was published Feb. 3 in The New England Journal of Medicine. For background, when the federal government refused to allow — and the courts blocked — Texas’ attempt to exclude Planned Parenthood from the Women’s Health Program in 2011, Texas created its very own, nearly identical program. To do that, Texas turned down $30 million in federal money and replaced it with $30 million of our scarce tax dollars with the express purpose of excluding clinics affiliated with an abortion provider — Planned Parenthood. That was a major policy shift and a blow to poor women of childbearing age, as many of Planned Parenthood’s 35 clinics were the only source of specialized family planning services in many rural and medically underserved areas. The move cut out an organization that provided 40 percent of the women’s health services in the state while promising access would be improved. Naturally, researchers at the University of Texas Population Research Center were curious as to what impact the exclusion would have. Collaborating with researchers at the Texas Health and Human Services Commission, which is required to keep comprehensive Medicaid data, a study was designed to measure the rates of use of the most effective contraceptives and rates of Medicaid-funded childbirth. Data were retrieved for two-year periods before and after the exclusion from counties that had a Planned Parenthood affiliated clinic and counties that did not. The study found that excluding Planned Parenthood affiliates led to a 35 percent reduction in claims for long-acting contraceptives, such as intrauterine devices, as well as a 27 percent increase in childbirths paid by Medicaid among users of injectable contraception. 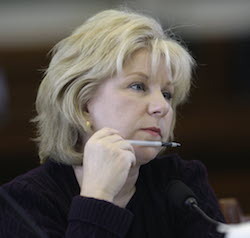 Sen. Jane Nelson, an architect of the Texas Women’s Health Program and Republican from Flower Mound, immediately cried foul. “Invalid,” “flawed,” “biased” were among the adjectives she used to describe the study almost immediately after publication. Time out. We’re talking about The New England Journal of Medicine here, for Pete’s sake. Like other scholarly journals, manuscripts are reviewed by several outside experts in a process called peer review. First delivered by horseback 204 years ago when bloodletting was a common treatment, it’s the oldest continuously published and arguably the most prestigious medical journal in the world. My money is on the New England journal, not the Texas senator, to determine the validity of a research study. Apparently confusing the study as an indictment of the Texas program as a whole, Nelson further complained that the study sampled only a narrow population of the health program. The study clearly states it never set out to evaluate the entire set of family planning programs in effect in Texas at the present time. But the senator went even further, writing Health Commissioner Chris Traylor to demand an explanation of how two commission researchers’ names appeared as co-authors on a study she viewed as political. Traylor responded back to Nelson in a letter dated Feb. 26 that “there is no record of authorization from anyone at HHSC for the two employees to co-author this study.” Neither their immediate supervisor nor anyone in HHSC leadership knew, he claimed. He further proclaimed that his agency demanded that the New England journal and UT immediately remove the two HHSC names from the study. What’s worse, co-author Rick Allgeyer, a quiet, erudite and revered director of research with more than 20 years tenure with the state, found himself without a job, officially in retirement but clearly ousted from the agency over the controversy. I’m guessing the senator and the commissioner are unaware of the industry standard — the three guidelines for authorship established in 1979 by the International Committee of Medical Journal Editors. They include substantial contributions to study design or acquisition of data or analysis and interpretation of data; drafting or revising the article critically for important intellectual content; and final approval of the version to be published. It was on the basis of those very criteria that the two commission researchers were invited as authors, according to corresponding author Joe Potter, who heads the Texas Policy Evaluation Project at the UT Population Research Center. Nelson may also not be aware that the state invests considerable resources for researchers with the capability and freedom to analyze findings so that policy impact can be evaluated. Sharing such research via publications is essential and expected to improve policy and health. Faced with hard data showing their policy shift has failed poor women living in underserved area, the only Republican response is to call foul? What’s foul are cover-ups, scapegoating and policy based on religion rather than the public interest. Toni Inglis, MSN, RN CNS (retired), FAAN, a lifelong Austin resident and retired neonatal intensive care nurse and editor of NursingNews, writes a monthly opinion column for the Austin American-Statesman editorial page.